Ahead is a Bluetooth speaker and controller that attaches to the side of a helmet. It was developed by a snowboarder who says he was frustrated that he couldn't communicate with a friend unless both stopped and got out their phones - in the cold. The device works with any type of helmet (cycling, construction hard hat etc.) and it produced good sound when I tested it in a very noisy convention hall. 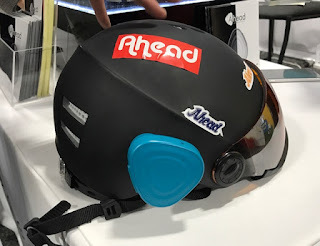 Ahead is slated to arrive later this year for under $100.